The North Beach Loop provides a reliable and frequent connection between Allison Park, Publix on 69 Street, North Shore Open Space Park, Stillwater Park, North Shore Branch Library, Crespi Park, North Shore Youth Center, Normandy Isle Park and Pool, and other destinations. 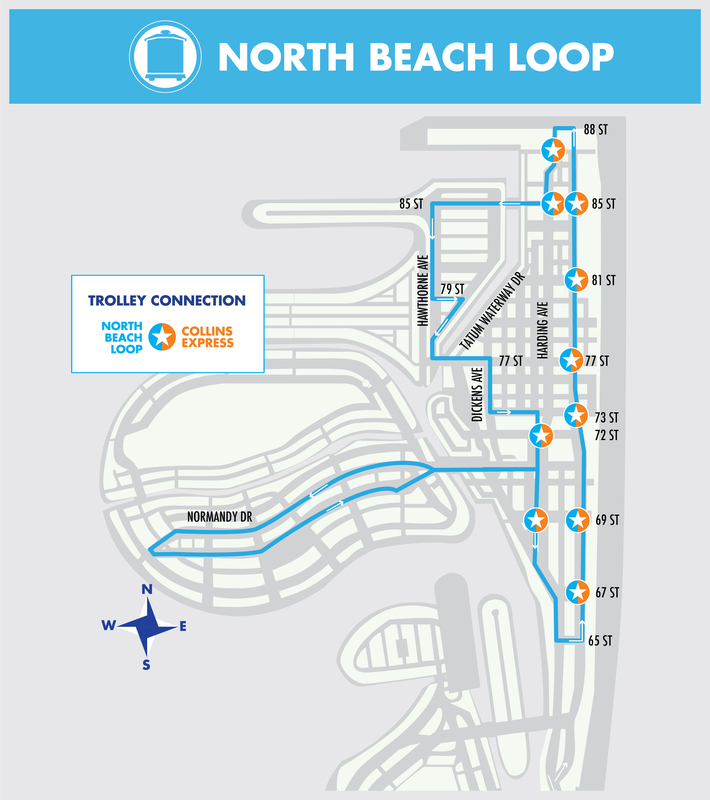 To improve connectivity and facilitate transfer between North Beach Loop and Collins Express trolley service, the North Beach Loop route alignment has been modified. Route section along Indian Creek Drive between 71 Street and Indian Creek Drive/Abbott Avenue Intersection was eliminated and route section along eastbound 71 Street and southbound Abbott Avenue was added. This route modification will enable for transfer from North Beach Loop to other transit services at Abbott Avenue/69 Street bus stop. Connects to Miami-Dade Transit routes: 120, S, H, L, 115, and 79. The North Beach loop is an enhanced transit service with ample interior floor space to provide easy access, ambassador style customer service, security cameras, free Wi-FI, and wheelchair ramps and lifts that will allow easy access of wheelchairs and disabled passengers.